Capri is an Italian island in the Tyrrhenian Sea off the Sorrentine Peninsula, on the south side of the Gulf of Naples, in the Campania region of Southern Italy. It has been a resort since the time of the Roman Republic. Features of the island are the Marina Piccola (the little harbour), the Belvedere of Tragara, which is a high panoramic promenade lined with villas, the limestone crags called sea stacks that project above the sea (the Faraglioni), Anacapri, the Blue Grotto (Grotta Azzurra), and the ruins of the Imperial Roman villas. Capri is part of the region of Campania, Province of Naples. The town of Capri is the main centre of population on the island. It has two harbours, Marina Piccola and Marina Grande (the main port of the island). The separate commune of Anacapri is located high on the hills to the west. 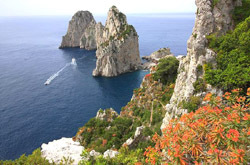 The etymology of the name Capri can be traced back to the Greeks, the first recorded colonists to populate the island. This means that "Capri" was probably not derived from the Latin "Capreae" (goats), but rather the Greek "Kapros" (wild boar).